Help Vinayak, an engineering student fighting for his life. Vinayak Gomakula, my childhood friend has met an accident while going home on a two-wheeler along with his cousin (expired on spot) when a small truck hit them on National Highway 7 at Hyderabad on 22nd January 2018. 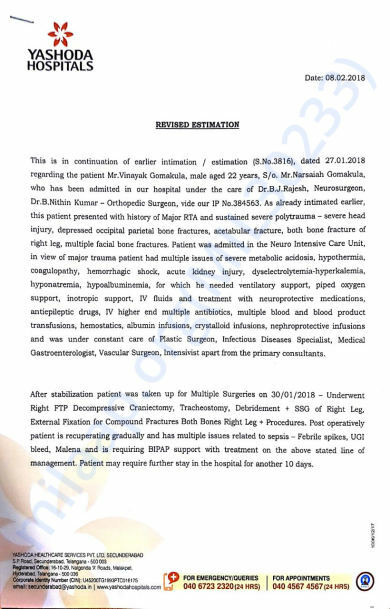 He is unconscious since then and taken to nearby hospital (Balaji Hospital, Suchitra Nagar) and then shifted to Yashoda Hospitals (Secunderabad). 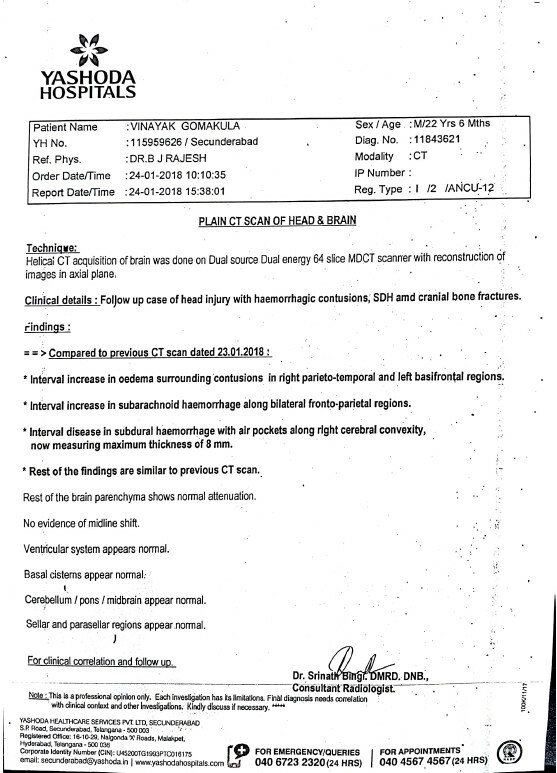 Doctors stated he had a severe head injury and damage to the brain as blood clotted, and doctors were not clear about the status as his blood pressure is unstable to operate. 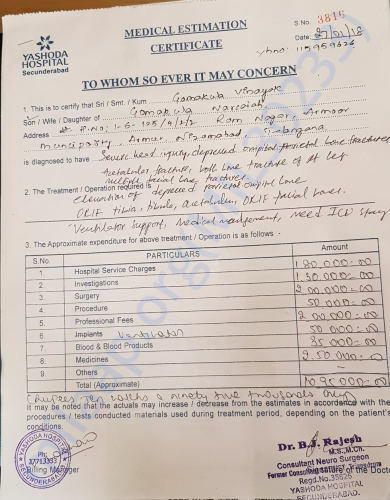 His blood pressure was brought to normal on 30th January 2018 and got operated on the same day and still, doctors are unclear about the status as he is still unconscious and will be operated further. 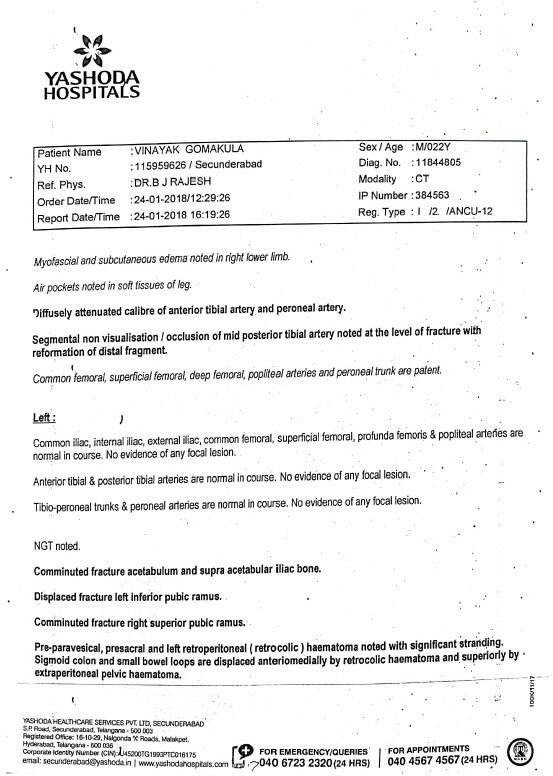 Doctors stated that one side of his body is paralyzed. 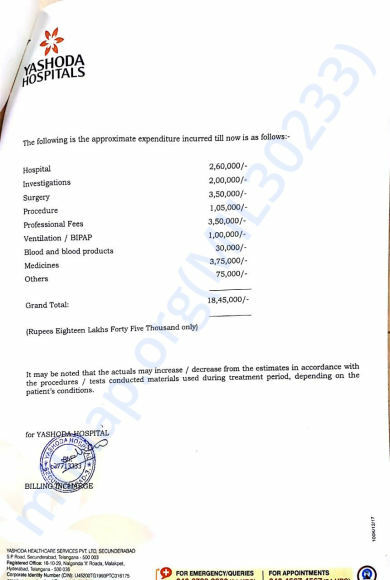 Financially it is very tough for us, Hospital expenses have crossed 14 Lacs till date (06th February 2018) and we do not know how much it will cost further and it may exceed 25 Lacs. Till now we have borrowed money from their relatives, friends and credit cards available and now looking for your support here. 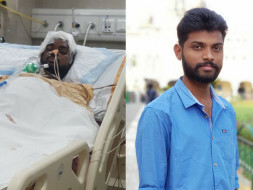 Vinayak Gomakula is an engineering student at Mallareddy Institutions, Hyderabad and pursuing his final semester in Computer Science fighting for his life. 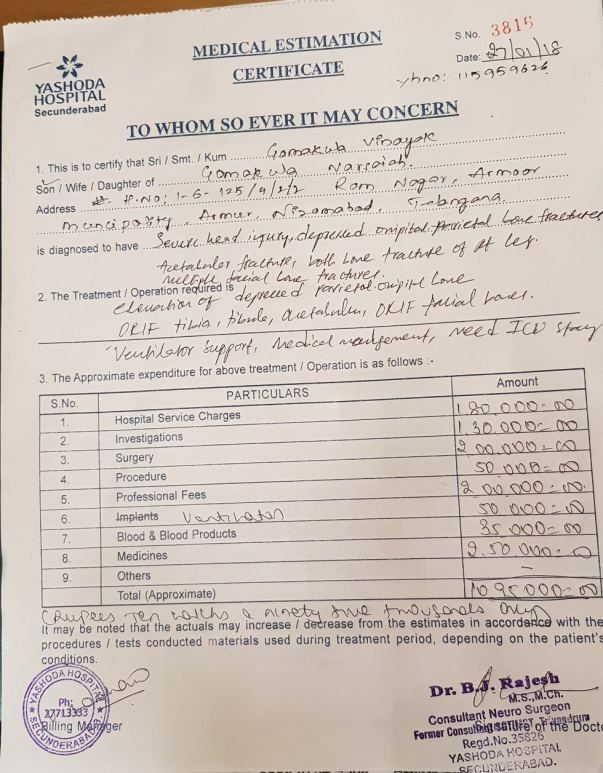 We request you all to support and pray for Vinayak Gomakula and his family to save him. You can contact Srinivas Gomakula (9533485656) for status and query. 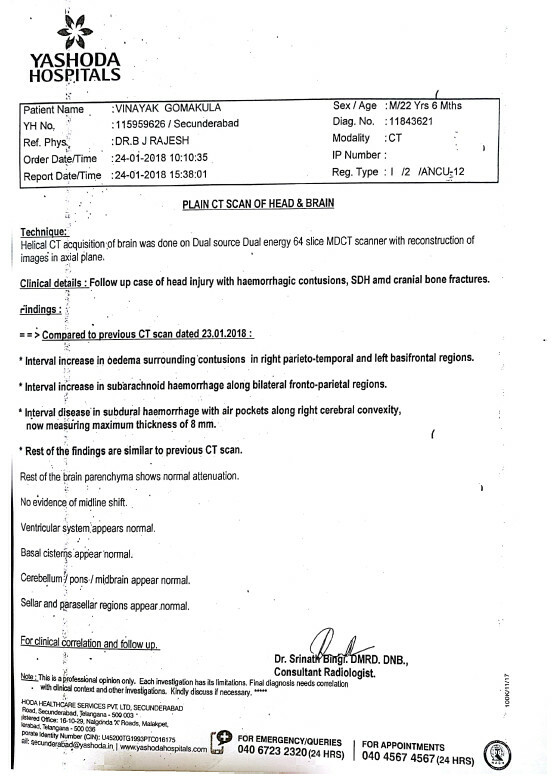 This estimation is given on 27th January 2018 and the same has been submitted to CM Office for support, we did not receive any response yet. Vinayak was discharged from the hospital 3 months ago and he is currently at home. There has been a significant improvement in his health since he was in ICU for a month. He has undergone 4 surgeries up till now and there is a Brain surgery scheduled for him next month. The family had him discharged because they were not able to afford the treatment at the hospital, so they arranged a facility at home for him. As of now, he's resting at home and he's on a liquid diet. The family is relieved to finally see some improvement in his health. Treatment is going on for him at home and the same will be done until his next surgery. We're really thankful to each one of you for the love and support which you have shown towards him.He is doing well now. 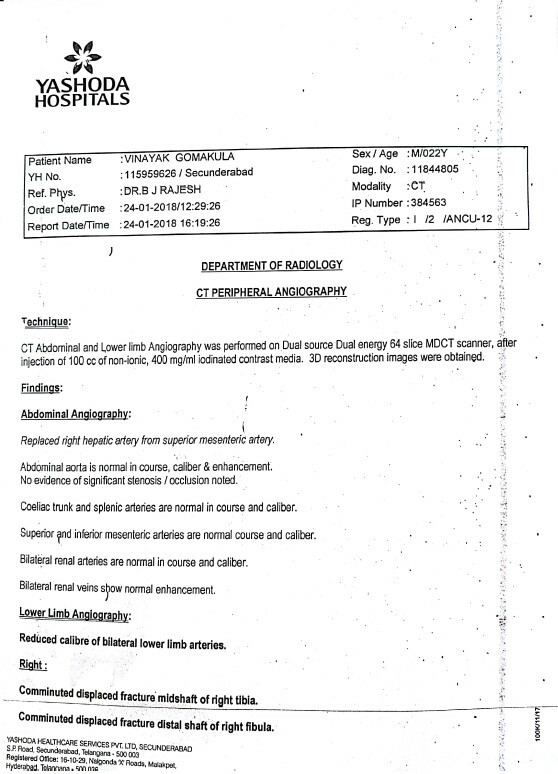 Vinayak was discharged from the hospital last month and he is currently at home. There has been a significant improvement in his health since he was in ICU for a month. He has undergone 4 surgeries up till now and there is a Brain surgery scheduled for him next month. The family had him discharged because they were not able to afford the treatment at the hospital, so they arranged a facility at home for him. As of now, he's resting at home and he's on a liquid diet. The family is relieved to finally see some improvement in his health. Treatment is going on for him at home and the same will be done until his next surgery. We're really thankful to each one of you for the love and support which you have shown towards him.